Encore: Sun. February 24, 2013 at 1 p.m. 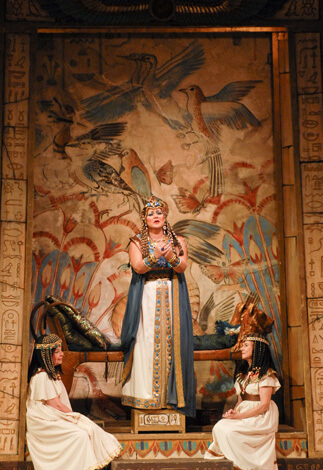 The Met’s unforgettable production of Verdi’s ancient Egyptian drama stars Liudmyla Monastyrska and Hui He. The story centers on the enslaved Ethiopian princess caught in a love triangle with the heroic Radamès, played by Roberto Alagna, and the proud Egyptian princess Amneris, sung by Olga Borodina. Fabio Luisi conducts this revival, which features recent choreography by Alexei Ratmansky.